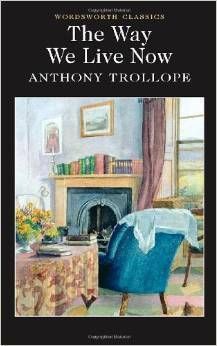 A mortifying admission, but I had never read anything by Anthony Trollope until last week. My youthful hatred of Dickens cast a shadow over the entire Victorian era. Nor did it help that Trollope had written so many books, none universally acknowledged as drastically better than the others, so one could feel confident starting with that. It’s the Joyce Carol Oates problem, made worse (it must be acknowledged) by his being a 19th-century male. I expected — what? Sermons, sentimentality, one-dimensional female characters. What can I say? I was a fool. “One’s judgment about one’s-self always does vacillate,” said Mr. Alf in a tone as phlegmatic as were the words. To which I can only add, yes, yes, yes. < Previous I No Longer Write Like Jane Austen! Add “The Warden/Barchester Towers” (http://en.wikipedia.org/wiki/Barchester_Towers) THEN you must watch “Barchester Chronicles” which features a very young Alan Rickman. A pure delight!!!! Thanks so much for this advice! I will. The only dark cloud in my new admiration for Trollope was not knowing which to read next. I realize now as I was reading “The Way We Live Now” that I had mentally cast Alan Rickman in the role of Roger Carbury — he’s rather like Colonel Brandon in S&S.